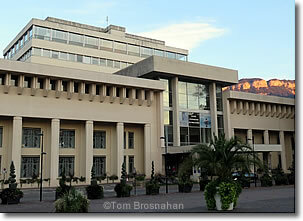 The Office de Tourisme is in the Thermes Nationaux, the unmistakable building that dominates the town center. The Office de Tourisme for Aix-les-Bains is in the imposing, unmistakable Thermes Nationaux building at the very center of the town across the street from the Hôtel de Ville (Mairie; map). The building is now used for other purposes, as an Institute of Health as well as for the Tourist Office. Note that in season there is also a Tourist Office on the waterfront, in the Grand Port area.